A protest of local miners that started off peacefully in two central Colombian towns has somehow created a humanitarian crisis, warned a human rights commission that visited the areas along with nation’s Inspector General on Saturday. Three people have been killed and several injured since the protests against multinational mining company Gran Colombia Gold began on July 21 and heavy handed tactics from the ESMAD anti-riot police force have worsened the situation. Immediate action to defuse tensions along with an end to the decriminalization of the protesters by authorities was demanded by the human rights commission “Colombia-Europe-United States Coordination” (CCEEU), which was accompanied on a verification mission by the office of the Inspector General, the High Council for Human Rights and the Ministry of the Interior. “We reject the military and warfare treatment that is being given to peaceful protest, excessive force and use of unconventional weapons, as well as drones. The community has evidence of snipers and the Esmad entering their homes, schools and hospitals, throwing gases at them and destroying them,” read a statement from organisation. Local miners took to the streets a month ago to protest against the multinational mining company Gran Colombia Gold and government decrees the miners claim disallow them to work independently. Miners later claimed that judicial and police authorities seek to criminalize them after the arrival initially of prosecution officials and later the feared riot police unit ESMAD. While Antioquia governor Luis Perez, who earlier claimed falsely the strike had been lifted, said the imposed curfew seeks to “protect the community and analyze who are the violent actors in the area,” the report from the human rights commission suggests that the situation has descended into crisis. The commission hit out at authorities, who it claims are seeking to criminalize the protesters and justify the aggressive tactics of the ESMAD riot police. We call attention to the possibility of presenting false judicial positives as a strategy to criminalize the protest and involve demonstrators in vandalism actions to deepen the stigmatization of these. Without taking action on prevention and protection and a negotiated solution, based on respect for human rights, we warn of a possible deepening of the humanitarian crisis that extends to the entire sub-region of northeast Antioquia. The protest has led to major tensions on the streets with miners regularly clashing with members of the police and the anti-riot ESMAD force. The first death of the protest occurred on August 3 when a 17-year-old boy was killed by two people on a motorcycle, the second fatality was registered on August 15 with the latest victim reportedly losing his life after being hit with shrapnel from an explosive device. In addition to the condemnation by the human rights organization, Colombia’s Inspector General reminded members of the Public Force that Directive 002 of June 14, 2017 should be complied with on “guidelines for the effective protection of the rights of human rights defenders and their organizations, members of political movements, social political leaders and their organizations” in accordance with the duty to respect the fundamental rights of citizens. As well as the ongoing security issues, everyday life in the Antioquia towns has been drastically affected with concerns being raised regarding schools and hospitals in particular. The verification mission confirmed that the municipal hospital has problems with the provision of service and there is shortage of medicines and medical-surgical material. Cadavid added that should there be more confrontations and injuries, the hospital may not have the means to provide adequate treatment. In addition school attendance has been hampered by the protests and the heavy presence of ESMAD troops on the streets. Some 10,000 workers that are on strike consider that government policies in conjunction with multinational companies are damaging their ancestral and traditional mining. Protesters have called for the signing of “fair contracts” between small miners and large foreign companies. 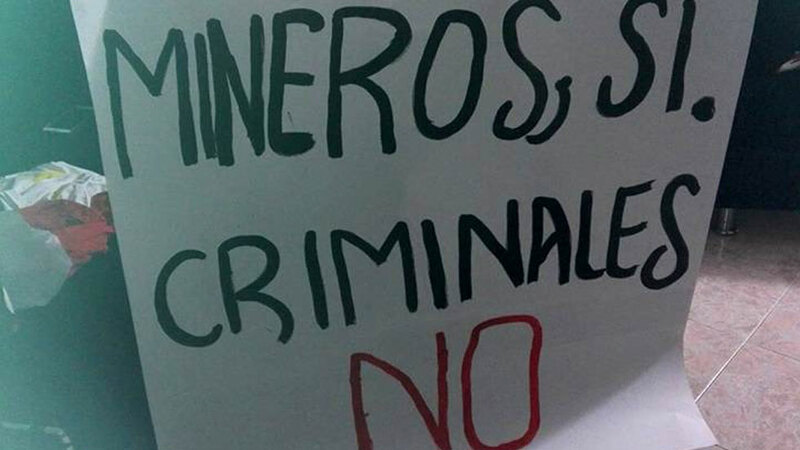 “We will not lift the demonstration until we have the guarantee that the government in the future will not come to exterminate our entire production chain,” said the president of the Remedios and Segovia Mining Bureau, Eliober Castañeda, reported El Espectador.